With businesses growing and the employment sector expanding by the day, it is common to find managers struggling with day-to-day payroll administration processes. In case you are one of them, then you may find that despite your best efforts you end up making mistakes in calculating the salary of employees working overtime or on a commission basis. Additionally, there are concerns about adhering to compliances related to the payment of bonuses and gratuities. Fortunately, help is close by. What does Payroll Processing Mean? Payroll processing is a term used to describe the task of managing all payments of wages by your company to salaried or contractual employees. The various steps involved in payroll processing include the gathering of employee information related to the management of deductions and benefits. The distribution of employee pay for any given time frame is also included within payroll processing. Most organisations use a third-party payroll processing service or a payroll software system for the purpose of payroll management. 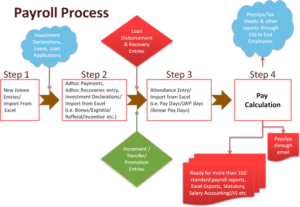 What Is Involved in Payroll Processing? The processes involved in payroll implementation depend on the processes that are critical and necessary for your organisation. In case your system lacks the presence of documented processes then the ideal time to go about the act is now. In some organisations, all the employees may be drawing only a salary with no perks or overtime. However, the payroll processes of most organisations are complex and involve a mix of hourly and monthly salaried employees. In such companies, the payroll processes include commissionable sales, salaries, perks, vacation/sick leave policies, payments for working overtime, etc. In addition, the payment processes vary depending on the seniority and work experience of different employees. 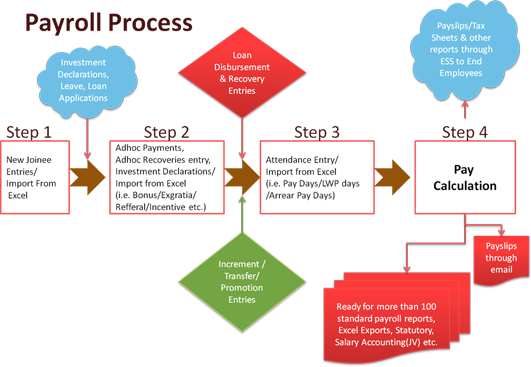 Also, an important aspect of payroll implementation in India is the one relating to the termination process. Although this is one of the most neglected and lesser used areas of payroll processing, it may include regulatory and security risk implications for your organisation. Why Is Payroll Processing so Important? The importance of processing payroll lies in the fact that it happens to be an integral part of any business operation. Along with handling the responsibility of employees’ salary compensation, your payroll department plays a crucial role in securing the company’s reputation by making sure that all necessary compliance with government regulations such as those related to employee benefits, Minimum Wages Act, etc. are adhered to. Be organised. The best payroll organisation processes include effective systems/processes for the management of tasks, deadlines, and responsibilities. Know your process. With no readymade process available, choose one that best suits your business model. Establish discipline, maintain accountability, and manage expectations while implementing the process of payroll management. If you are grappling with the many nuances of payroll processing, then it only makes sense to outsource your problems to a third-party payroll service provider such as Paysquare. The company is known for meeting the demands of organisations looking for effective payroll management.